My two favorite kinds of dresses are: pink, and black. Here’s another one for my collection! It was about 15ºF when I sewed this, but I can’t wait to wear it all summer. I bought Vogue 9236 right when it was released, but it needs a lot of fabric, so I never got to it. When selecting patterns, I usually look at the line drawings - they are more accurate - but this time I liked the breezy illustration. I love Very Easy Vogue patterns - they are simple to construct, but always have thoughtful details. I think they are “very easy” for advanced begginer/intermediate sewists on up. 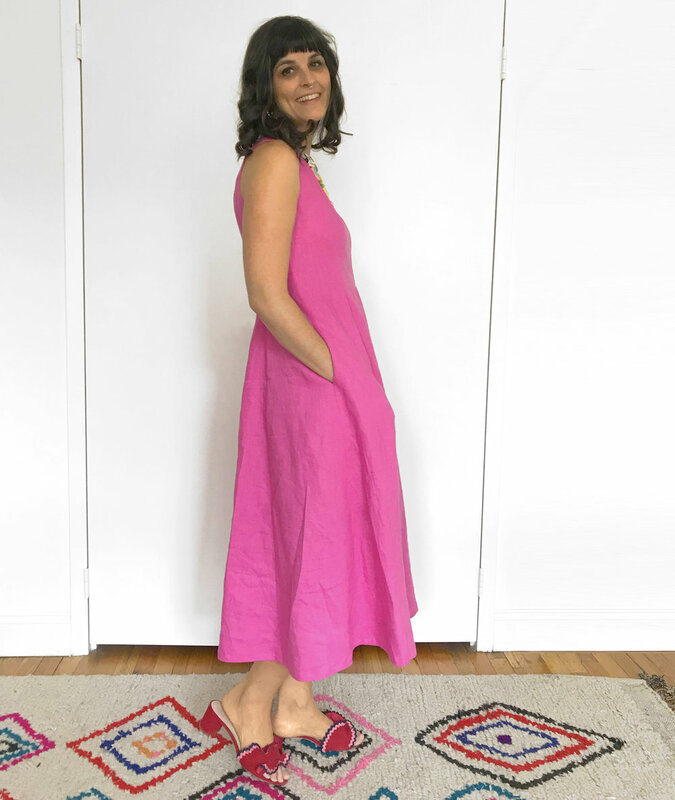 The simple lines and minimal seams makes this dress perfect for linen. This dress is very full, but it hangs nicely. I enjoy making self fabric bias binding - it makes the interior look very clean. The zipper was hand pick-stitched. I updated my labels last year and I love sewing them in! Interior seams are finished with 3 thread narrow overlock to keep things tidy. I used every scrap of fabric to make this dress, so I didn’t have enough for pocket bags. I used pink & white gingham from my stash. Zipper is hand pick-stitched, which I can do pretty fast. 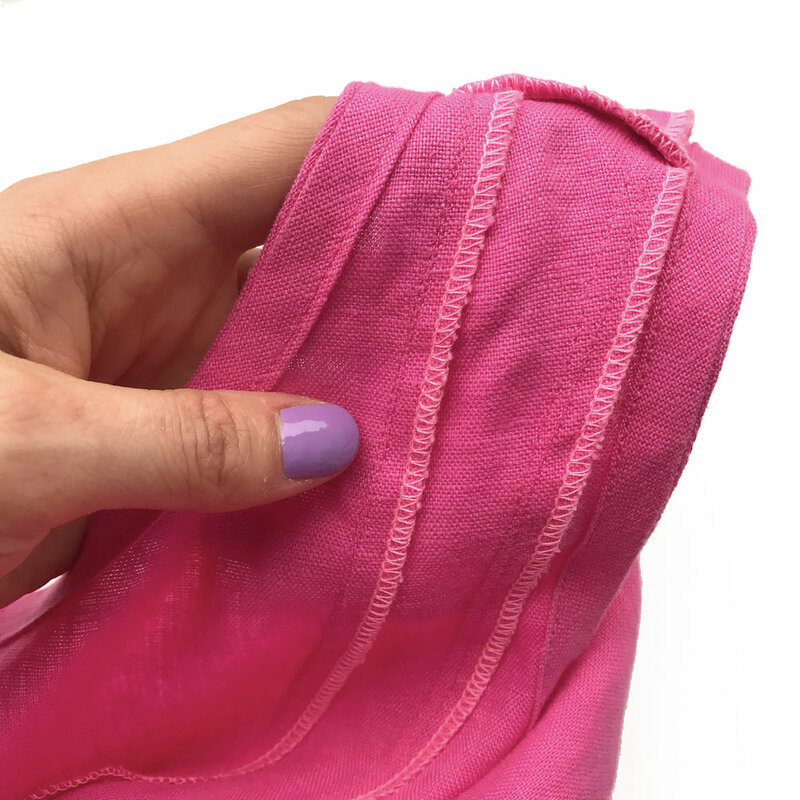 It’s a strong stitch, but it’s easy to rip out in case you need to replace this zipper. I may one day replace this with my invisible zipper foot. 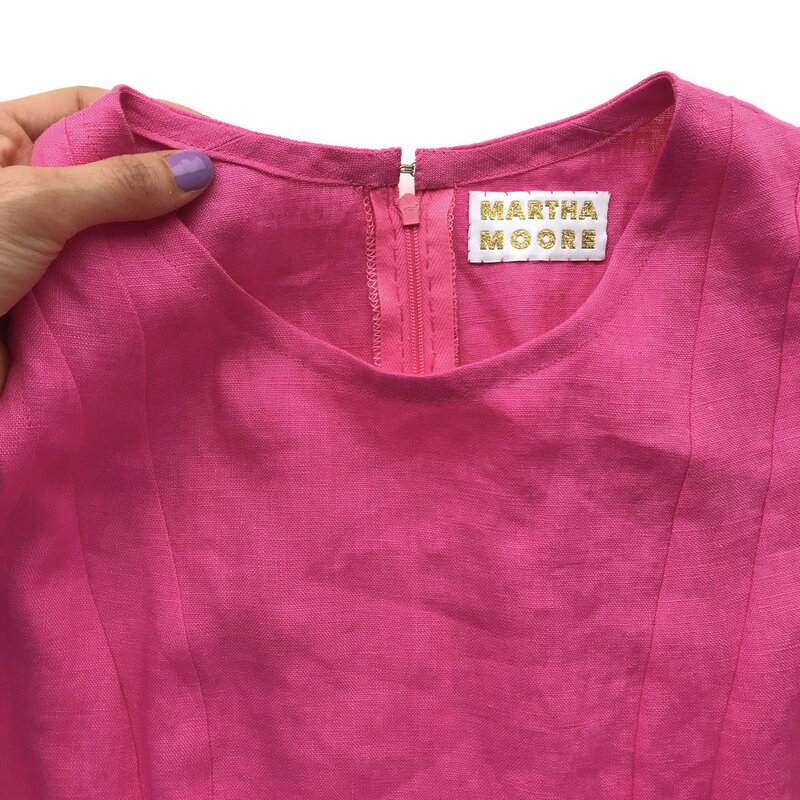 "Fitted dress with back zipper has front and back released pleats." Pattern Sizing: I chose my usual Big Four patterns 12. Yes. It is a simple pattern, but the way the pleats are formed is interesting. I found this well drafted and I enjoyed sewing it. I like the illustration, and only 4 pattern pieces. Perfect for hot days & chunky necklaces. Only dislike is lack of pockets, but that’s an easy addition. Mid-weight linen from stash, prewashed several times. Between stay stitching, long seams, wide hem, etc. I went through an entire 110 yard spool of Gutterman thread. • I squeezed the longer version out of 3 yards of 56” wide fabric (envelope calls for 4). This was possible because this fabric has no nap, and most importantly, is the same face/back. • To transfer the dart markings to my fabric, I cut out and removed the inside of the dart from the pattern paper (save it for later), and then you can easily trace that shape. The outlines will be your staystitch and/or seam lines. • Lengthened bodice 1" (my usual alteration). That is the only alteration I made for fit!! • Added in seam pockets (in pink gingham). • Made self fabric bias binding. • Hand pick stitched zipper. • Serged exposed interior seams with 3 thread narrow overlock. • The length of this dress surprised me - longer than expected and true tea length on me. I am 5'8". If you are shorter than I am, the longer length might be Maxi. I shortened the dress 3”. If I make this again, I’ll make a slight hollow chest adjustment, which I often do on high neck princess seam bodices. Sure, I’d happily sew this again at some point. Yes, I recommend this pattern. It is simple and lovely.